Some ARs aren’t really fooling anyone. Although billed as hunting rifles, behind the camo façade these guns are really just tactical ARs dressed in sporting garb. Occasionally a rifle comes down the pike that lives up to its promise to be a gun you’d enjoy carrying in the field. One such rifle is Wilson Combat’s new Ultralight Hunter. The development of the Wilson Combat Ultralight Hunter parallels the development of Wilson’s new cartridge: the .300 Ham’r. Bill Wilson, an avid hunter, was looking for a .30 caliber hunting cartridge that would work with a standard 5.56 bolt, and after researching available options, the Wilson team decided to use its own 7.62x40 Wilson Tactical cartridge as the basis for the new round. The 7.62x40 case was lengthened by .040 inch, which allowed for maximum case capacity for improved performance while preventing the .300 Ham’r from accidentally being chambered in 7.62x40 or 5.56 rifles. “We wanted to use all the powder space, all the way up to the neck,” Wilson said. And that’s just what they did with the .300 Ham’r, combining 110- to 150-grain .30 caliber projectiles with flat bases and short overall lengths with full-capacity powder charges to generate a round capable of driving a 130-grain bullet out the muzzle at 2,450 fps. Wilson’s Armor-Tuff finish holds up well to abuse. The Forest Green camo pattern is applied by hand at Wilson’s Arkansas facility, and no two rifles look exactly alike. Early tests proved Wilson’s experimental load could achieve those numbers without pushing pressure limits, but Hodgdon’s Ron Reiber convinced Wilson to try his company’s newly developed CFE BLK powder. Wilson did and found the new powder was capable of producing results that nothing else on the market could match. 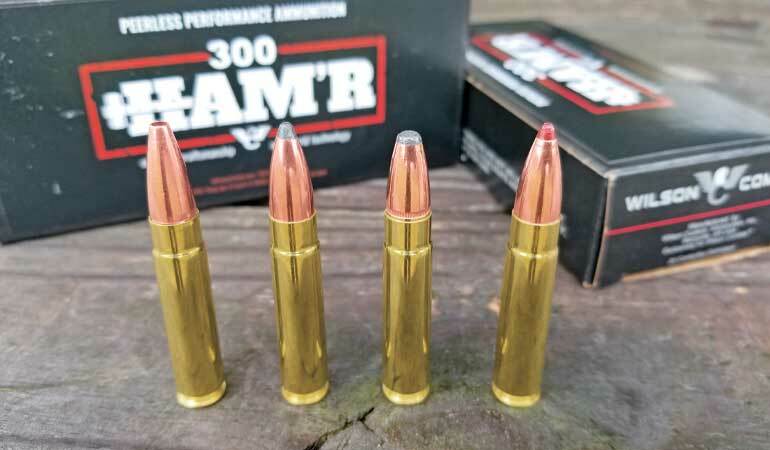 The .300 Ham’r produces the best ballistics of any .30 caliber round that functions with a 5.56 bolt, and the performance advantage over the .300 BLK is stark. At 200 yards the Ham’r has 18 percent more velocity, 40 percent more energy and 56 percent flatter trajectory than the Blackout. At the muzzle the .300 BLK attains a muzzle velocity of 2,175 fps to the Ham’r’s 2,540 fps. After extensive powder, case and bullet testing, Wilson came up with the rifle cartridge he’d wanted. Now all he needed was a superb hunting rifle to mate with this new load. ARs have many characteristics that make them fine hunting guns, but many of them aren’t particularly light. A sleek bolt gun may weigh less than six pounds, but the average .300 BLK AR with a 16-inch barrel weighs about 6.5 pounds unscoped. The Wilson Combat Ultralight Hunter, by contrast, weighs in at just under six pounds. Plus, with an overall length of just 35 inches, it’s shorter than most competing .300 BLK rifles. 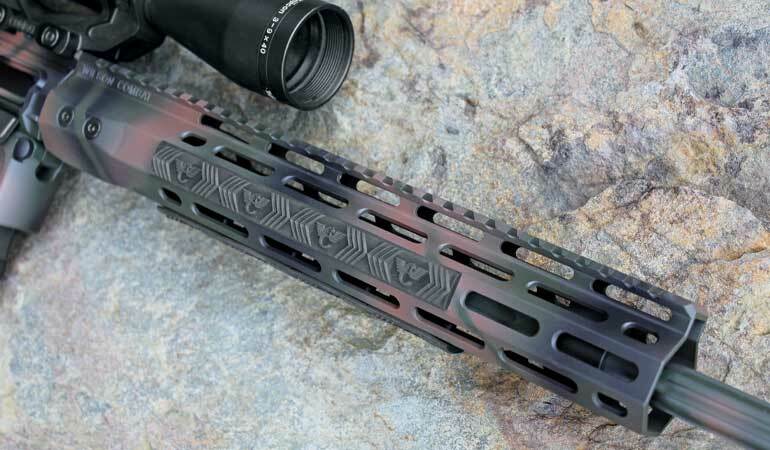 The 12.6-inch handguard is Wilson Combat’s own design and weighs less than a pound. It’s also M-Lok compatible, which makes adding accessories fast and easy. The weight savings begin in the stock. The Ultralight Hunter comes equipped with the Wilson Combat/Smoke Composites carbon-fiber closed-shoulder buttstock with a fixed 10.1-inch length of pull. The minimalist design keeps mass low, but you can’t easily change length of pull. The design not only makes the stock lighter, but also reduces snags and hang-ups when carrying this gun in cover. There’s no “drumming” when the stock strikes branches, rocks or buttons on clothing that occurs with some competing polymer stocks. In addition to being light and nimble, these stocks are also extremely durable. In fact, Bill Wilson used one of them while doing development testing on his .338 Federal rifles, and despite the constant pounding of thousands of rounds of heavy ammunition, he said the stock held up extremely well. The gun I tested came equipped with a Wilson Combat/Bravo Company Starburst polymer pistol grip. It has a reduced grip angle for a more comfortable, secure hold on the rifle as well as a hinged trapdoor on the base for water-tight storage of small items. The lightweight machined billet upper and lower receivers are free of sharp edges and add minimal bulk to the rifle, and the flat-top design offers plenty of space for adding any type of optic, from red dot sights for close-range work to high-magnification variables for long-range shooting. Like the upper and lower, the handguard is Wilson Combat’s own design and is machined in the Wilson factory from 6005A-T5 aluminum. The 12.6-inch rail offers Magpul M-Lok attachment points at the three, six and nine-o’clock positions and comes with three three-section Magpul rail covers. The total weight for the rail is just 12.4 ounces, which also helps keep the overall weight of the rifle to a minimum. Other key features include a low-mass nickel/boron bolt carrier, intermediate-length gas system, BCM Small Latch Charging Handle and Wilson Combat’s Tactical Trigger Unit M2 two-stage match trigger made from heat-treated H13 steel. Designing the right barrel for the .300 Ham’r required considerable time in the lab—and lots and lots of barrel adjustments and changes. For starters, Bill Wilson had to determine which twist rate was needed to stabilize bullets from 110 to 150 grains. “We tested a variety of twist rates and found that 1:15 was the best to stabilize bullets in that range,” Wilson said. But Wilson didn’t simply test twist rates; he also worked to determine the number of grooves and ideal groove dimensions to optimize performance with the .300 Ham’r cartridge. In the end, the 1:15, six-groove design proved to be the best and provided the type of accuracy Wilson wanted from his new rifle. The four .300 Ham’r loads tested include (from l.): 110-grain Lehigh Controlled Chaos, 125-grain Sierra Pro-Hunter, 130-grain Speer Hot-Cor and 150-grain Hornady SST. “The loads will all stabilize in 16-inch barrels, but 18 inches seemed to be the sweet spot,” Wilson said. Once he’d determined twist rate and groove design, Wilson began experimenting with barrel thickness to determine how light the barrel could be made and still perform well with the intended loads. “We found the lightest barrel contour that would still produce good five-shot groups in temperatures to 100 degrees,” he said. The Ultralight Hunter I tested wore one of these minimized barrels. It measures just 0.7 inch at the muzzle and lacked a threaded muzzle, which Wilson said is in keeping with the hunting rifle theme since most hunters don’t add a muzzle device—although the Wilson Combat custom shop will build your rifle however you’d like. The barrel on the test rifle was fluted and crowned, and all metalwork was treated with Wilson Combat’s Armor-Tuff finish in forest camo. Each of these rifles receives a hand-applied finish in the factory, so no two guns look alike. My sample came topped with a Trijicon AccuPower 3-9x40mm attached to the rifle via Wilson’s machined 7075 V3 Ultralight scope mount. The rifle/optic combination weighed less than 7.5 pounds. There are currently eight different .300 Ham’r loads available from Wilson Combat, as well as two loads available from HSM. I tested the Wilson loads, and accuracy was outstanding across the board. All averaged less than an inch, and only one group of the 12 tested measured more than an inch. I also fired a 10-shot group that measured 1.23 inches. Impressive stuff. Those tight groups are certainly credit to Bill Wilson’s extensive development of this rifle/load combination. Accuracy is further enhanced by the fact that the Ultralight Hunter comes equipped with a light, easy-to-manage two-stage trigger that breaks cleanly at four pounds—as advertised. And despite its minimal mass, the Ultralight .300 Ham’r is a soft-shooting rifle. 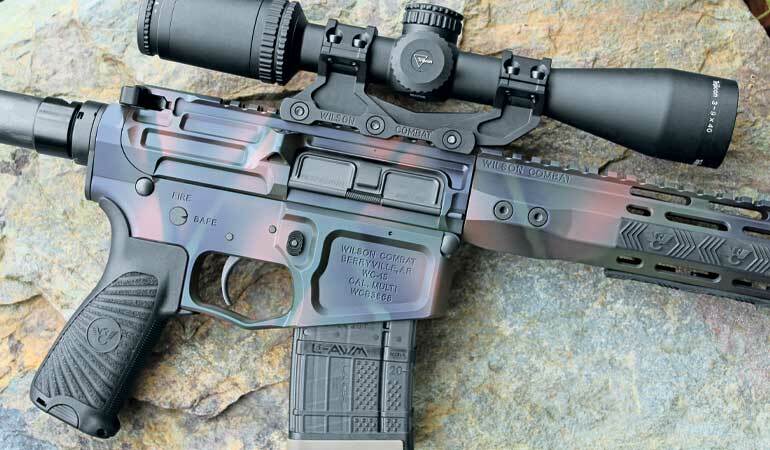 Recoil is lighter than what you’ll typically encounter with a considerably heavier AR-10 rifle, yet the .300 Ham’r nips at the heels of the .308 in terms of performance. Even the most recoil-sensitive shooters will shoot this gun well. There were no cycling issues throughout the entire test. 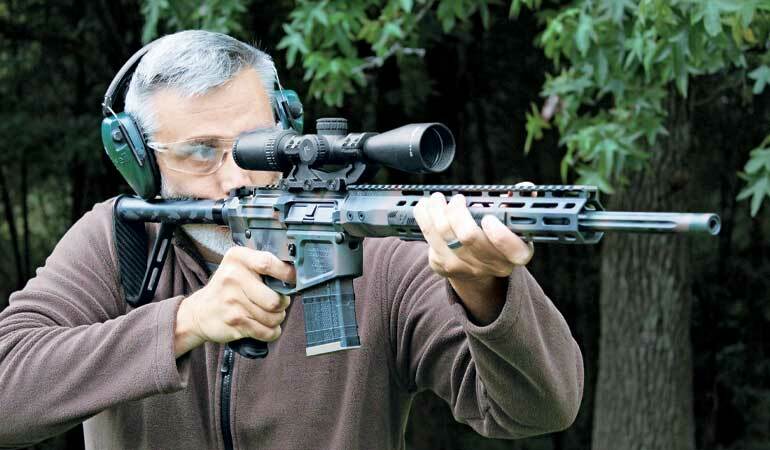 Has Bill Wilson developed the perfect hunting AR? That’s a matter of opinion. And while the Ultralight Hunter is not a cheap rifle, with a base price of $3,295, you can rest assured the level of refinement and design elements are on par with any rifle in that price range. The Ultralight Hunter in .300 Ham’r is also perhaps the most versatile hunting AR ever to arrive on the market. It’s extremely accurate, utterly reliable and light enough for high-elevation hunts. The cartridge will endear itself to any AR hunter because it offers better ballistics than competing cartridges at moderate pressure levels, and it functions with a 5.56 bolt. There’s no question about the Ham’r’s legitimacy as a big game cartridge, and the Ultralight Hunter’s compact design makes it ideal for hunting whitetails from a tree stand, calling predators into thick brush or sneaking up on a sounder of hogs. The .300 Ham’r has merits as a self-defense round, as well. If you’re sold on the round but simply can’t fork over three grand for a new gun with any hopes of remaining happily married, there is good news: Wilson Combat offers aftermarket barrels in .300 Ham’r. Hunting ARs are evolving, and the Ultralight Hunter and the new .300 Ham’r cartridge are a significant step forward.